Printed material – newsletters and brochures – are costly, and the more information you put into a printed packet, the more expensive that packet becomes. But there is no extra cost to placing more information on your website, other than the time it takes to create the material and get it placed on your site. So how should you and the administrators of your website decide what to make available to clients? According to Spectrem research, there is no decision to be made. Provide it all. Don’t hold back. Spectrem’s latest study of affluent investors and their usage of social media and mobile technology shows that investors are looking for financial and investment information in a variety of forms, and the place they most want to access that information is on the website of their financial advisor or provider. Using Social Media and Mobile Technology in Financial Decisions asks investors to describe how they use the new world of communication for the purposes of researching investment products and services. Among Ultra High Net Worth investors with a net worth between $5 million and $25 million, social media usage is not high. Only 52 percent of UHNW investors use Facebook, 37 percent use LinkedIn, 30 percent use YouTube and only 17 percent are on Twitter. The investors who use social media want to be able to connect with their advisor on those sites, but there are obviously many investors who do not search for information on social media. But investors do use the internet to research investment products and services. Most investors still prefer to get their information from the written word in form of articles, but they can find an endless supply of articles on the internet, and they want to read those articles their advisor presents on the company website. Fifty-three percent of UHNW investors want to read articles and research on financial topics and products on the website of their advisor. Asked to place the likelihood of reading an article or blog on a variety of website choices, UHNW Investors rated their interest in reading the article on their financial provider’s website at 50.93, compared to other financial websites (47.45), websites of major financial media like CNBC or Fox Business (46.91) or the websites of major news networks like CNN, the Wall Street Journal or the New York Times (41.73. The value of that information is that investors will look wherever they can to find the information they want, but that their first stop will be their advisor’s website. If their advisor provides the information they are looking for, they may stop their search, which means they do not get exposed to advertising other firms may place on those aforementioned news or media sites. When the internet was invented, the world of video presentation skyrocketed, and today many investors get a large amount of information from watching videos. 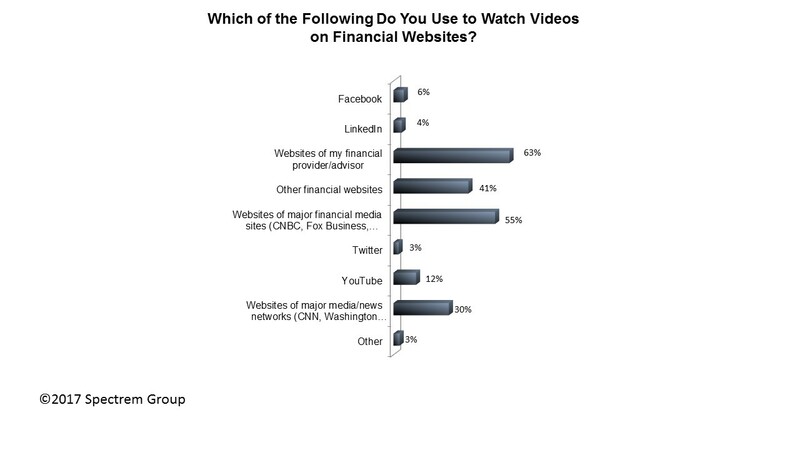 Thirty-five percent of UHNW investors watch videos on financial websites, with a preference for current event discussion, educational videos or videos of financial commentators. And guess where they want to watch those videos? Sixty-three percent watch on the website of their financial provider or advisor, more than 55 percent turn to CNBC or Fox Business, and more than the 30 percent who go to CNN or the Wall Street Journal website. Articles, blogs, videos, personal services like account balances, new product offerings – these are all items affluent investors want to be able to peruse on the website of their financial advisor. Now it is up to the advisor or financial provider to make sure the information the investor wants is on their website. Because if it is not, the investor will go elsewhere to find it. It’s true that the internet is free, but it costs money to have someone monitor and administer our website, and it costs money to employ someone who is in charge of putting articles and videos on your site. But the Spectrem research indicates that it is not a wasted expenditure, because investors are looking for that material and are going to your site first. The goal is to keep them from going elsewhere. Are investor relations impacted if the information is not available to them on your website? The answer is yes. Spectrem research shows that many investors determine whether they want to work with an advisor or a financial provider based in part on their presentation on their website and their participation in social media. It may not seem like internet presentations actually add to the bottom line for advisors, but research shows that ignoring internet use can make advisors seem behind the times. And that is not a good look.